If you’ve been keeping tabs on Game Of Thrones recently, you should know that HBO is having a special event this weekend in certain IMAX theaters, airing two episodes from Season 4 along with a brand new trailer for Game Of Thrones Season 5. This morning the trailer has leaked. Check it out, below. In the trailer, we get to see more of Tyrion’s beard, along with plenty of shots of Cersei still acting pissy over Tyrion escaping the castle and murdering their father in the process. Elsewhere in the kingdom, Tyrion seems to be doing okay, and Sansa is still spending time with Littlefinger, learning the ways of the world. 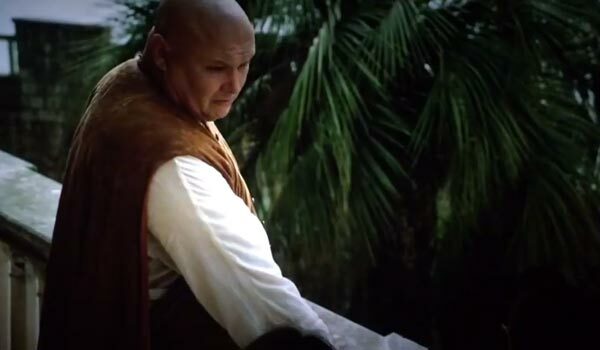 And wait, is that Varys? It is Varys. It's nice to have brief updates on characters like Littlefinger and Tyrion, but I think we've all been waiting some time to see more from the Sand Snakes, the beautiful, cunning and dangerous women from Dorne who will be introduced this season. In the trailer, we get a nice look at one lady's skills with a whip. That should be Jessica Henwick playing Nymeria Sand, the second oldest of the Sand Snakes who is displeased about what happened in King's landing between the Viper and the Mountain last year. She's supposed to be skilled with a whip, and she crushes it in the trailer. Tyrion responds with his usual cynicism, saying, "Good luck finding him." And Varys responds with his usual wit, "Who said anything about him?" 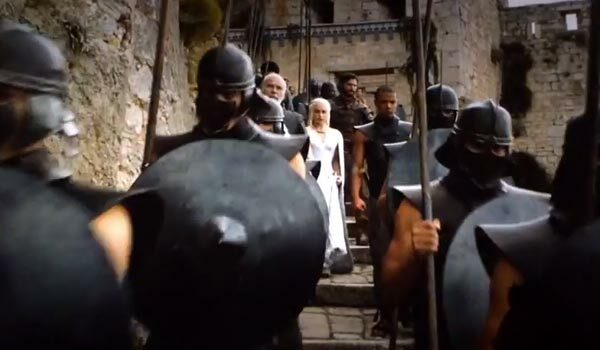 So hopefully Dany will find herself with a few more people in her corner sooner rather than later! If you haven't heard about the big Game of Thrones event this weekend, showings are available in various cities across the United States. The screenings run from January 29 through February 5 and will give fans a chance to see the Season 4 episodes “The Watchers on the Wall” and “The Children," which have been digitally remastered for IMAX presentation. The trailer is also included in the package. Game of Thrones is exactly the right type of show to benefit from a larger screen, so if there are showings nearby, we highly suggest you check them out. Here's the full list of participating theaters. HBO's Game of Thrones will officially premiere on April 12, 2015. In addition, here's everything we know so far about the upcoming season.